Barns might typically be associated with farmland, but in today’s market, they have functions beyond just housing animals and farm equipment. More specifically, barns are becoming desirable options for wedding and event venues. Timber frame “party barns” are trending as one of the top venue choices for wedding ceremonies and receptions thanks to what brides are calling “rustic chic.” These barns have a casual appeal that provides an alternative to formal banquet halls or upscale hotel celebrations. The open design and natural materials used in timber frame barns help provide this casual mood, setting a memorable scene for any size event. Using timber frames brings the outdoors inside, and by simply adding barn-style sliding doors, you allow for a transition between interior and exterior entertaining. The timbers and trusses bring an instant focal point to a barn’s design by creating tall and dramatic ceilings. Building your barn out of timber frames also adds longevity to the structure thanks to the durability of the materials and craftsmanship involved in timber frame construction. The concept of a timber frame party barn is so versatile that this type of structure works well for more than just weddings. Party barns are also ideal for family reunions, as backyard hangouts, or as an extension of your home to serve as guest quarters or entertainment space. To achieve the perfect event or living space for you, there are a few questions you should consider before designing a timber frame barn. What style of barn do I want? Will I need any special permits in order to build a party barn on my property? What will the main use of the barn be? Do I need to include a full kitchen? Multiple bathrooms? I don’t want a timber frame barn kit. Am I willing to be patient for a custom design? When you’re ready, our talented team of designers has what it takes to make your timber frame barn plans a reality. 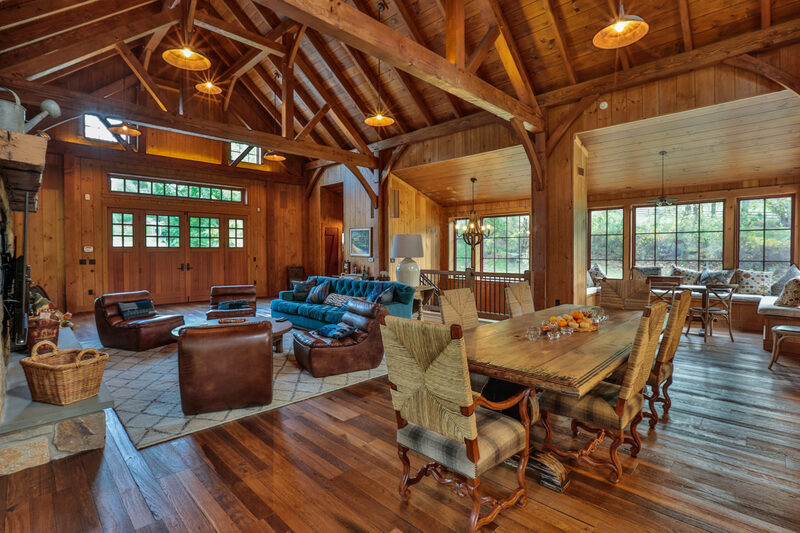 Whether you’re starting from scratch or already have a plan in mind, let Mid-Atlantic Timberframes impress you with the perfect design for a timber frame party barn. Previous - Why Build a Timber Frame Home?